Moving to college and into the dorms can be a stressful experience, but it can be much less stressful and much more fun if you’re prepared – you want to do as much as possible ahead of move-in day to alleviate stress. Laney (a senior at OU), Lauren (a senior at OSU), and I put together these tips to help you be as prepared and stress-free as possible as you’re moving to college. Keep in mind that it’s normal to have mixed emotions – everyone does! You are moving into your home-away-from-home for the next year and moving away from the familiar to the largely unknown. Emotions vary among individuals, but you may feel a mix of apprehension, excitement, anticipation, and anxiety, plus a number of other emotions. No matter how many times you’ve visited friends or siblings in the dorms, it is still a first for you. You may be feeling uneasy about having a roommate for the first time, wondering how hard college classes will be for you, nervous about making friends and/or going through recruitment, plus your parents will be full of mixed emotions too. It’s all normal! Walk your classes and find your exact classrooms before move-in day. One big suggestion is to lessen the stress about classes and the start of school by walking your classes in the order of your schedule to ensure that on the first day of school you will know exactly where to go and how long it will take you to get from one place to another. It’s ideal to do this a week or so before move-in, if you’re close enough to make a day trip to your college campus. If you choose to join a sorority, it is common for older girls in the sorority to help their new members find their classes sometime after bid day. But it still can really help with stress to walk your schedule and find your classes before moving in. I also wrote a blog post with success tips I collected from college students who have walked in your shoes and have been successful – check out the blog post on College Success Tips here. Discuss rooming expectations with your roommates and/or suitemates ahead of time. You’ll want to discuss sleep schedules, shower schedules, sleeping preferences, morning alarms, and having friends over. Also talk about things like your routine for buying toilet paper, cleaning the bathroom, vacuuming, etc. This will hopefully prevent passivity or conflict in the future. Talk about schedules and routines before the semester gets into full swing and get ok with being direct about the ground rules you’ve agreed on. This will really make your living situation as positive as it can be. Some students have never shared a room before, or they’ve had their moms do everything for them, so it’s very common to be surprised by your roommate’s and suitemates’ living habits, no matter how well you know them beforehand. Your room is really your home away from home and your getaway from the craziness and stress that college can bring, so you want to be comfortable coming home to it! The most important key to lessen the anxiety of move-in day and to make it as smooth as possible is to be prepared! Be prepared mentally, emotionally, and physically. You need to anticipate that it is going to be a little hectic and exhausting mentally, emotionally, and physically, for both you and your parents. Having these expectations and knowing that it is ok for both parents and students to feel these things will lessen the surprises for the day. Make sure to take care of yourself before move-in day, so you don’t start out at a physical deficit. You’ll want to get several nights solid sleep, eat well, and exercise before move-in day. Pack your belongings in large (31 – 36 gallon size) Rubbermaid-type containers. They can easily be labeled with packing tape with your name and dorm room. They also take up much less space once they’re unloaded because they can be stacked. Then your parents can take them home to store during the semester. If you’re going through sorority recruitment, plan ahead and pack each day’s outfit in separate garment bags. Include your clothes, undergarments, accessories, and shoes – put everything you’ll need for the day in the same garment bag. Put your jewelry in a small ziplock bag and your shoes in a larger one in the bottom of the garment bag. This way you won’t have to worry about deciding what you’re going to wear or misplacing anything. Arrive the day before if possible. Drive to your college town the day before move-in day with everything loaded up to get a good night’s sleep. Then all you’ll have to do the morning of move-in is drive to campus with everything in tow ready to be unloaded. This will prevent traveling obstacles, lessen the stress of loading everything up the same morning you are moving in, and minimize any worries that you’ll get to move-in on time. Take advantage of the Express Check-In option, if your campus offers it. You will have to get there earlier in the morning to move in and pay a fee, but it is highly worth it. You will avoid a lot of the traffic and the hectic-ness of move-in day, plus it will be cooler. If Express Check-In is not offered, definitely pick the earliest time slot available. Coordinate with your roommate(s) what time you will move in. Coordinating with your roommate(s) to move in at different times is also helpful in minimizing stress and allowing you to get settled in with fewer people in the room at a time. Just be sure to have your layout planned out beforehand and be agreed on which beds/dressers/areas will belong to whom before things are officially moved in. At OU, we recommend the layout where the beds are on a higher setting, so the sets of drawers can go underneath, but not lofting the beds. Consider breaking up your move-in process. 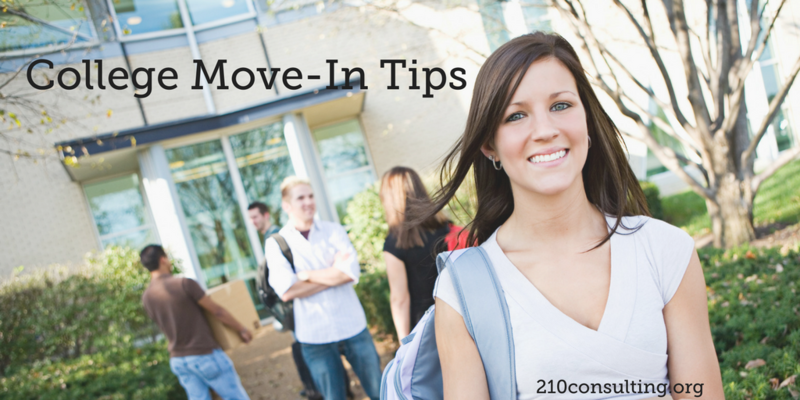 Especially if you and your roommate(s) have agreed to stagger your move-in times, break up your move-in morning by getting settled in partially and then taking a lunch break before you come back and fully settle everything in. 1) Mattress topper. The mattresses in the dorms are like the ones from a camp bunk bed (i.e., not very comfortable). If you have no issues sleeping any where you might not need one, but I strongly suggest even a cheap egg crate topper you can find at Walmart or Target for less than $20. 2) De-humidifier. There is little ventilation in some dorms, like the towers at OU, and especially in the hot humid summer months, the humidity can be oppressive. So invest with your roommates in a good-sized dehumidifier. Even if you choose one of the several gallon ones, you will have to empty it twice a day. 3) Window curtains. There are blinds on the windows, however, if you are at all light sensitive, the blinds will not block out much sunlight. Getting a pair of inexpensive solid curtains with an adjustable rod from Target will make a world of difference and add a little color to the room. 7) Towel wrap and/or cheap flip flops. Flip flops to shower in are not that important if you live in a suite, like at OU, but in a community-style dorm, you’ll definitely want to wear flip flops when showering. 8) Hooks. Over the door hooks, command strip hooks, etc. are great to put on the back of the hall door, the closet doors, and the bathroom door for hanging purses, towels to dry, and keys. 9) Command strips. These are essential for hanging decorations, pictures, etc. on the walls because nails are not allowed. They actually hold very well and will help make your dorm room more personalized by covering the walls with artwork, lights, pictures, etc. If you join a sorority, you will be showered with canvases and other décor items on bid day, so don’t stress too much about bringing décor to hang on your walls. 10) Power strip and extension cord(s). The outlets are limited and can be in tricky places like behind a closet or bed, so these are a must to be able to plug in everything you need. 11) Extra-long phone charger. This gives you even more flexibility, so you can charge your phone easily. 12) Rug. The floors of the dorm are a hard laminate tile material, so a rug makes your dorm room much more cozy and homey, quieter, and warmer when its gets colder. 13) Mini-fridge and microwave. If you live in a dorm without access to a community kitchen, you will be very thankful if you have both a mini-refrigerator and a microwave. 14) Brita water purifier. The water in the bathrooms typically doesn’t taste good to drink, so it’s best to get your drinking water from the dorm lobby where they have filtered-water filling stations. But a Brita water pitcher (or another brand) is great to use in your room. Fill it up in your bathroom and then keep it in your mini-fridge for convenience. 15) Box of first-aid items. You won’t regret packing an assortment of first-aid items in a plastic container (shoebox-size) and keeping it at the bottom of your closet, just in case. Include acetaminophen, ibuprofen, Band-Aids, Neosporin, Tums, thermometer, Benadryl, nasal spray, etc. 16) Fan, white noise machine, and/or earplugs. If you’re a light sleeper, you will be thankful you have something to drown out the noise in the dorm or your roommate coming in later at night. There are several white noise apps you can get for your smart phone – one in particular we like is the floor fan option of White Noise Ambience Lite. 17) Clothes steamer. It can be a lot easier to use a steamer to get wrinkles out of your clothes, rather than an iron and ironing board. My Little Steamer by Joy Mangano is the one we use and really like – it’s available at Bed, Bath, and Beyond and other places. 18) Download this Dorm Packing List of other items you might want to pack for your dorm room. Don’t overly stress about forgetting any of these things on move-in day. You’ll probably discover other things you need too. A trip to Target, Walmart, Home Goods, or Bed Bath and Beyond is not hard to do for those forgotten or last-minute items. However, the stores may be packed and picked over, especially the day of move-in, so it’s ideal to be ahead of the game and prepared with these things beforehand. Bike and bike lock. This is not an issue at OU, but at OSU and other campuses, the dorms can be quite far away from the classrooms, so it can be really helpful to bring a bike. At OSU, you’ll need to get a permit to park your bike on campus. Another option if you’re farther away from campus is to take the OSU bus – click this link for a map of its two routes and the hours it runs. And if you’re worried about walking back to your dorm late at night from the library or anywhere else, at OSU you can call 405-744-6523. At OU you can call 405-325-9255 and ask for a public service officer to walk you safely home. This service is available seven days a week from 7 p.m. to 3 a.m. at OSU and 8 p.m. to 3 a.m. at OU. Business-professional outfit or two. It’s important to have a couple of business professional outfits for on-campus interviews for all the different campus organizations that you can get involved in freshman year. Laney, Lauren, and I hope these suggestions will help make your move-in day and transition to college go as smoothly as possible! Excellent advice! Thank you for sharing…I too, will share for my College Grandkids and others. Thanks so much, Judy! I’m so glad the post was helpful and appreciate your sharing! Thank very much for sharing these tips to everyone.